The 1x25 AR Optics TRS-25 HiRise Red Dot Sight from Bushnell is a lightweight tactical optic for close-range targeting. This AR Optics series sight features a brightness-adjustable 3 MOA red dot that can be illuminated with 11 different brightness settings to meet the demands of ambient lighting conditions. This model from the AR Optics series is configured with a built-in Weaver rail mount that is engineered for shock-resistant performance when correctly mounted atop an AR-style rifle. 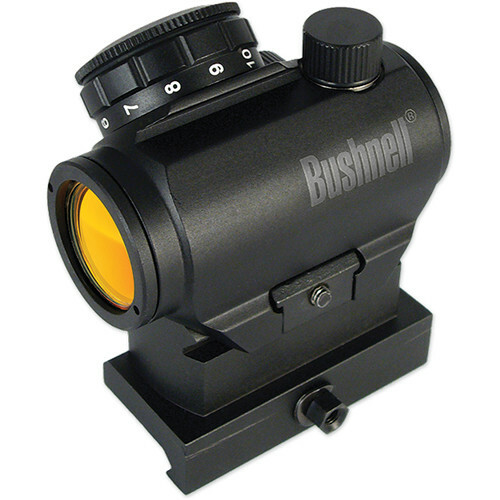 The unmagnified optics have multiple layers of Bushnell's Amber-Bright high contrast coating for enhanced image quality and improved target acquisition in low light. The 1/2 MOA point of impact adjustments and unlimited eye relief further equip the TRS-25 for the speed and accuracy needed from a tactical weapon system.